Osteoporosis is characterized by deterioration in the strength and density of bones, causing them to become fragile. It happens when a person loses too much bone tissue and/or their body isn't able to make enough to maintain bone health. According to the National Osteoporosis Foundation, 54 million Americans have osteoporosis -- or low bone density -- that places them at risk, and about one in two women and one in four men over age 50 will break a bone due to osteoporosis. Given those statistics, knowing about prevention is essential, as is learning about osteoporosis treatment for those who are affected by the disease. Osteoporosis can be prevented by taking care to give your body what it needs to build strong bones, then keeping them that way. Ideally, osteoporosis prevention should begin in childhood, when bones are still developing, but no matter your age, there are things you can do to improve bone health. There are three basic steps to preserving bone health: getting adequate amounts of calcium in your diet, getting plenty of vitamin D and ensuring that you are engaging in weight bearing exercise on a daily basis. To help build and maintain healthy bones, the National Institutes of Health advises that children up to 8 years of age need 700 mg of calcium daily and 1,300 mg between ages 9 and 18. Adults under 50 need 1,000 mg per day, while 1,200 mg is recommended after age 50. Good sources of calcium include dairy products, dark green leafy vegetables, salmon, sardines, soy products and beans. If you have difficulty getting enough calcium in your diet, taking a supplement is wise to ensure you have plenty to protect bone health and density. National Institutes of Health recommendations for vitamin D intake are as follows: 600 IU daily for children over 4 years old and adults up to age 70. After age 70, 800 IU per day is recommended. The best source of vitamin D is 20 minutes of exposure to sunlight daily, which triggers the manufacture of this vital nutrient in the skin. Vitamin D is naturally present in a few foods, such as fatty fish, like tuna, salmon and mackerel, egg yolks and liver. Many foods are fortified with vitamin D, including milk, other dairy products and many cereals. Getting enough vitamin D from foods is difficult, so supplements are often recommended, especially during the winter months when sunshine is not strong enough to trigger adequate levels of production by the body. Like muscles, bones need exercise to stay strong; the stress of weight-bearing exercise triggering production of new bone cells for bone repair and maintenance. Weight-bearing exercise includes walking, aerobics, tennis, dancing, stair climbing, or most anything else that gets you up on your feet. For maintenance of bone health, 30 minutes of moderate exercise daily is recommended. 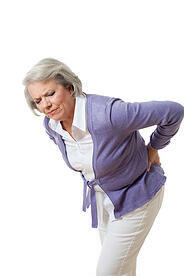 If you have been diagnosed with osteoporosis, you are likely already aware that there is no cure for the disease. However, it is very possible to significantly slow the progression of the disease and, in some cases, improve bone density and reverse its damage to some degree. Depending upon your personal circumstances, your doctor may suggest medications to treat osteoporosis. Some can slow or stop bone loss, while others can help increase bone formation. Each, like all medications, has some risk of side-effects that should be discussed in detail with your doctor before therapy begins. Other common elements of osteoporosis treatment include increasing intake of calcium and vitamin D and physical therapy to preserve and possibly increase bone health, increase strength and flexibility, and improve posture, body alignment and balance.